Assemble this Layered Taco Salad in a Jar…or two or three and have a tasty, no-mess, healthy, low-cal salad throughout the week. Did I mention the peach salsa dressing?! Lots of tips to prep any salad in a mason jar! I’m late to the party. But, now that I’m here, I’m lovin’ it! I’m talking about the mason jar craze. What a great make-ahead meal strategy. Just properly layer your favorite ingredients in jars, and you have fresh, no-prep salads throughout the week. I’ve been chowing down on this taco salad in a jar for 3 days now. It’s so easy to just grab it out of the fridge and dump it out on a plate. It has some of my favorite ingredients and it’s low-cal too! And yes, it’s still fresh 4 days later! It’s all in the packing. Yeah, just like a suitcase. If you do it right you are rewarded with a lovely, care-free travel (umm..I mean dining) experience. The dressing always goes in the mason jar first. Combine two Tablespoons of your favorite salsa (mine is Newman’s Own Peach Salsa) with 1 Tablespoon of light sour cream or vegan substitute. Next add firm vegetables. Firm, as in they won’t go mushy by touching the dressing for a day or two. In fact, they might even taste better after marinating a bit. I added grape tomatoes and hearts of palm. A word of caution, diced tomatoes and soft fruits, like strawberries, do not work well. Add these at serving time. Some other vegetables that would be great are carrots, celery, peppers, cauliflower and even grapes. The next layer could be a little heavier, like a protein. I was multi-tasking and violated the order in the picture. The black beans really should have been below the shredded cheese. 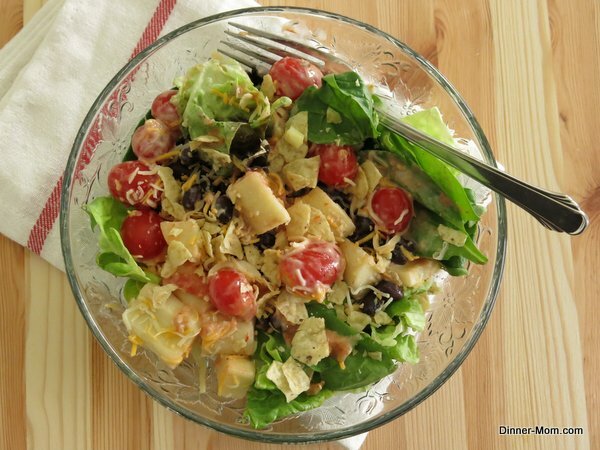 Of course, diced Baked Lemon Pepper Chicken or 3 Ingredient Salsa Chicken would also be nice in this salad too. Another option is to add a grain, like bulgur wheat or lentils. Add that type of ingredient next. Lighter items go next, such as black olives. For other salads, this is where you would add nuts, seeds or dried fruit. Add cheese or vegan shreds next. Now stuff in your lettuce. I used a combination of baby spinach and butter lettuce. Mix a little fresh cilantro in with the salad greens. The taco salad in a jar is capped off with a few tortilla chips, which I lift out first and then crumble on top of the salad once it’s on a plate. Wrap the chips in a paper towel to keep them crispy or add them when you are about to enjoy the salad. If you have everything out, it’s really just as easy to make 3 or 4 salads as it is to make one. For best results, make sure your ingredients are “dry” before you put them in the jar. I used a quart sized mason jars, a smaller size would work for a side salad. Placing a paper towel at the top of the jar will absorb excess moisture. You may want to avoid ingredients with strong odors, such as onions. Add these on serving day, if desired. 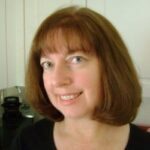 Use low-fat cheese, salsa without added sugar and leave off the chips to keep this recipe South Beach Diet Phase 1 compliant. Leave off the chips to keep it gluten-free. The salads will stay fresh for 4-5 days. When you are ready, dump it out and arrange it on a plate. I think it’s very cool that the lettuce greens come out first and the toppings, well they end up on top. Stir and enjoy! If you need more inspiration, check out the beautiful salads over at the Lunch Box Bunch. 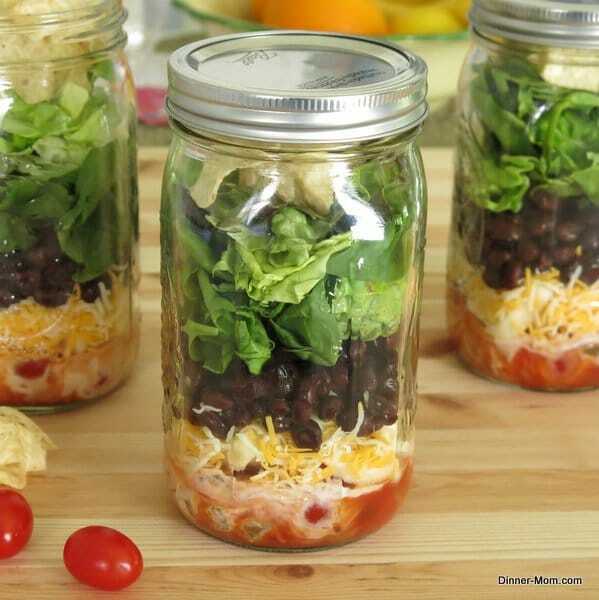 Assemble this Layered Taco Salad in a Jar...or two or three and have a tasty, no-mess, healthy, low-cal salad throughout the week. Mix Salsa and Sour Cream together and layer in the bottom of the mason jar. Layer the remaining ingredients in the order presented. Cap and store until ready to serve. Pour contents onto a plate and toss to coat with dressing. Top with crushed tortilla chips, if using. There's lots of room for variation! 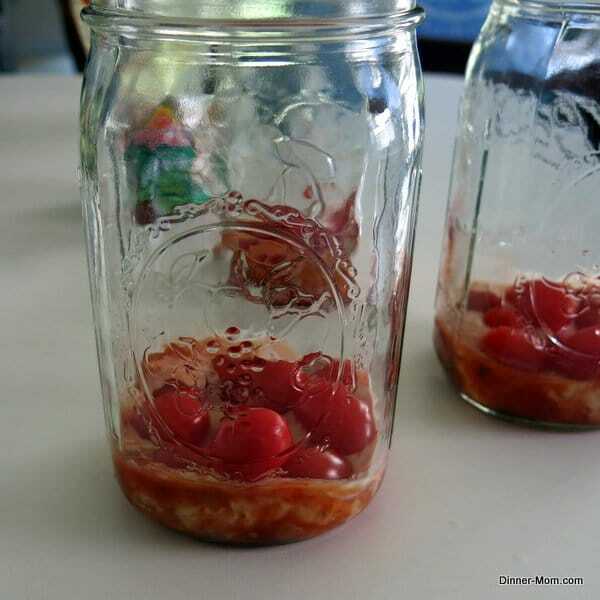 Store jars in refrigerator for 4-5 days. This would be perfect for our little trips to the lake! Absolutely! No fuss or mess, more time playing. What a cool idea! I’ve never thought about putting a taco salad in a jar, but that makes sense since it can be deconstructed or as a burrito! 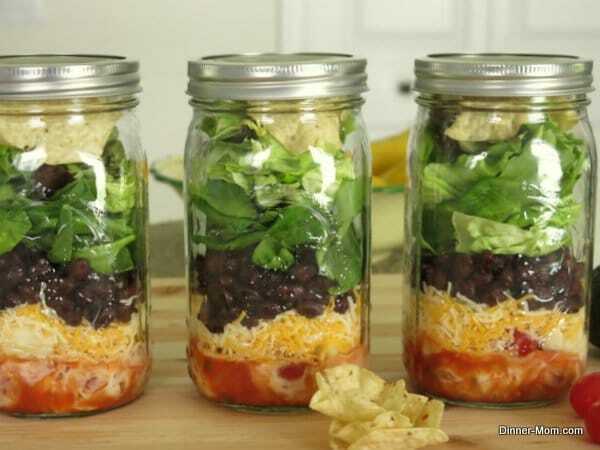 Looks great, I have got to try making these mason jar salads, I have wanted to forever!! Thanks for the inspiration!! Thanks Tara! I’m ready to have lunch set for a few days! What a really smart idea. I don’t know why, but I’ve never made a salad in a jar. This would be such a great idea for my husband to bring to work. What a great idea! I love using my mason jars! 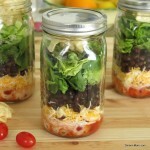 I’ve got a cabinet full of mason jars – what a great idea for a portable salad! I need to join in on this mason jar craze!! These look so good – love that you can see all the layers through the jars! I really do love the idea of a salad in a jar…I can’t believe it’s (yet another) thing that I haven’t tried yet. Your taco salad sounds fantastic. Thanks for sharing the order of packing, I hadn’t really thought about it yet, and this will help when I actually get around to making some! Nothing beats the versatility of mason jars! I could go for your salad…right now! I haven’t tried the whole salad in a jar thing yet, but I love the concept. And I LOVE that peach salsa dressing! 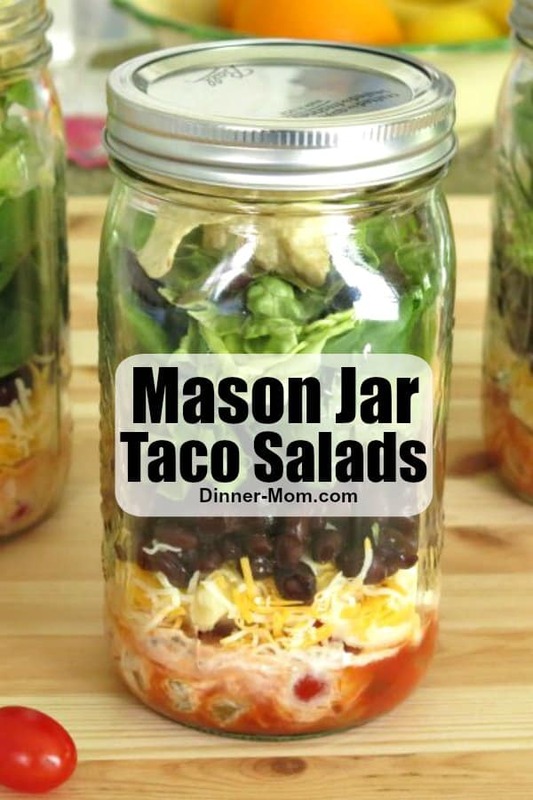 I have been wanting to use my mason jars for salads for awhile now, I NEED to cause Taco anything is my kind of jam! Love it! I finally got some jars to try this. The yogurt/salsa mixture is perfect. Wait to top with the chips until you are about to eat them. Will do this again.